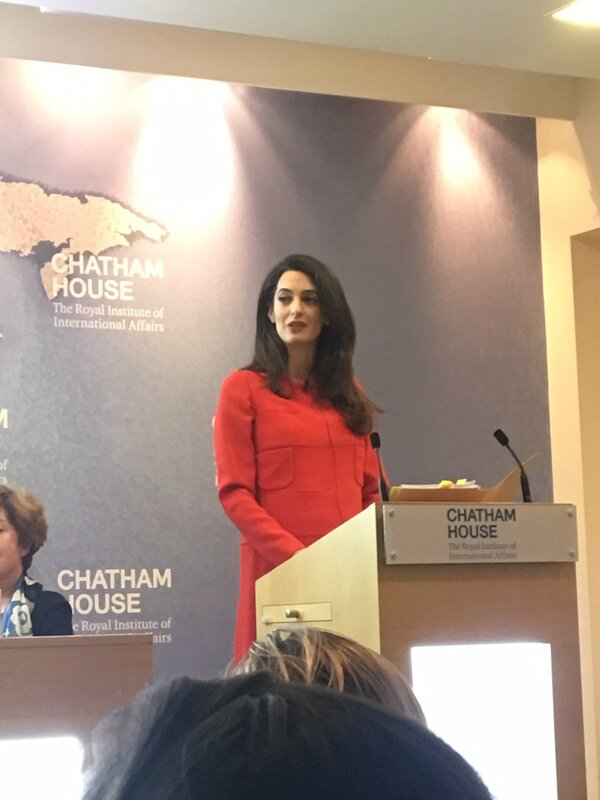 Today evening Amal Clooney was speaker at the event Accountability: International Crimes in Syria and Iraq organized at Chatham House, London by Doughty Street International. The event was sold out. War crimes, crimes against humanity and genocide are being committed in Iraq and Syria. The speakers discuss measures to hold perpetrators accountable, focusing on: crimes committed on behalf of governments, crimes committed against the Yazidis by ISIS, and prospects for prosecution in domestic courts. Altuzarra introduced a new bag shape for Fall ’17 called The Shadow, because it’s suppose to follow you everywhere you go. So important and she looks stunning. Are Amal’s outfits borrowed from designers? WoW! I am amazed @ how well Amal “hides” her baby bump with her designer choices. You would not know she is nearly 7 months pregnant with twins. Perhaps she is not sue in June. Perhaps she is not pregnant. She is wearing Ermanno Scervino Fall 2017. I found it by myself and it is not the first time that she wears this brand. 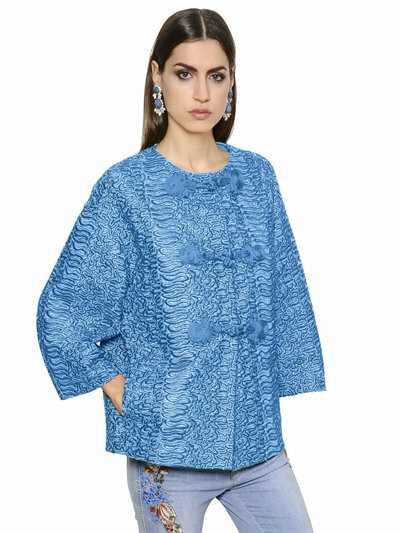 Baria’s outfit looks like a chinese pyjama. She really has a knack for picking most inappropriate and hideous garbs that do absolutely nothing for her body type. Amal and her mother share a tacky sense of fashion. Wait, why is her mother there? It kind of diminishes Amal’s credibility if her mother tags along. I’d never take either of my parents to work with me, even if we worked in the same field. Lady – Her mother is part of her PR team. I suspect that Baria likes the limelight as much as Amal. Here’s Baria at the Frontline Club with Amal speaking with M. Fahmy. 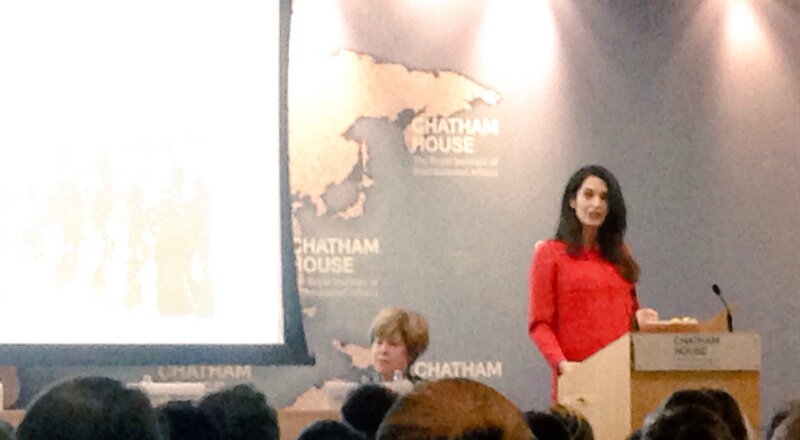 The pictures of Amal and her mother are of them going out to dinner later in the evening, not from Amal’s speaking event. 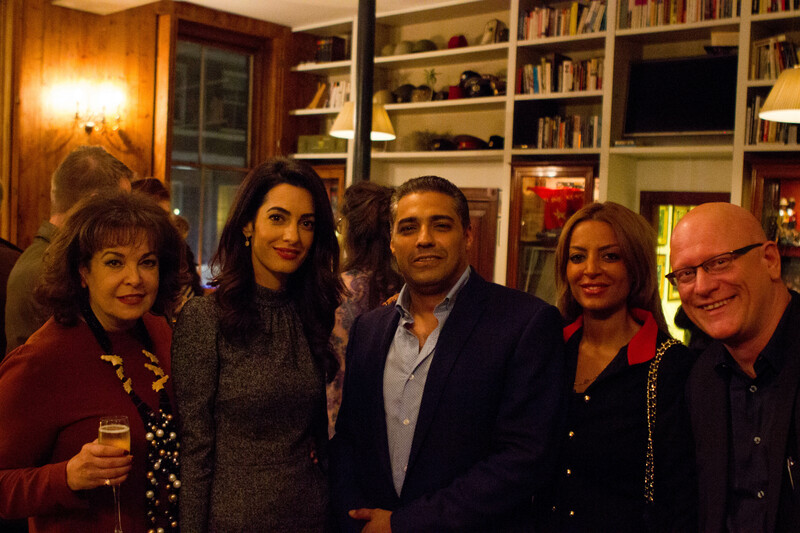 Baria accompanied Amal to her speaking engagement with Mohamed Fahmy where Baria sat in the first row. There are other professional meetings and outings where Baria was present. Baria helps navigate Amal’s public speaking events. Do you think that just because Baria was only photographed at the dinner she didn’t attend the event? For real? Baria was present at the UAE meeting too. Jessica – Chill out. All I said were that the pictures of Amal and her mother were from the dinner, not the event. I specifically avoided saying whether or not Baria was at the event, because I didn’t know the answer to that. I was just stating a fact based on the information I had. For real. @ Lily Chill out. For real. Why do people get so worked up about this blog? It’s a blog about a woman who married a celebrity and her selection in clothes. 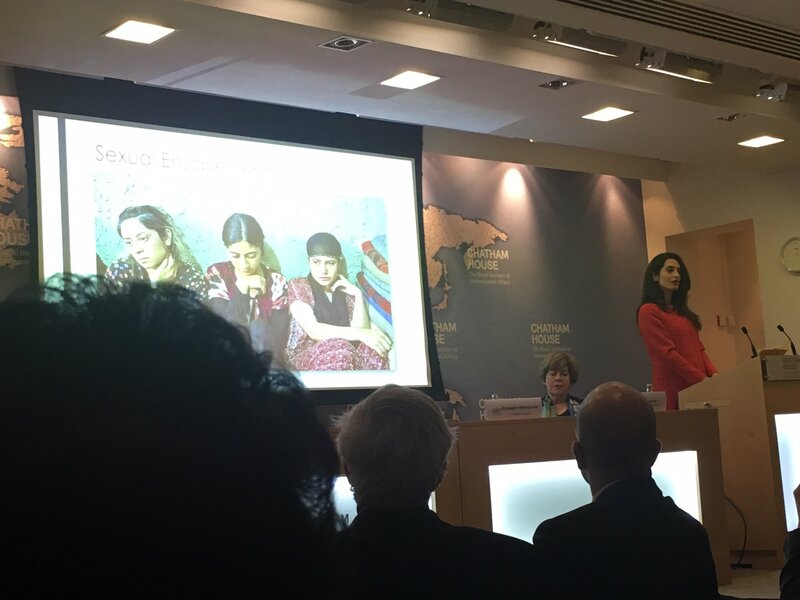 Lady et al: I just do not get why you care if Amal’s mother attended a presentation. She is a journalist so it makes sense to me and even if she wasn’t perhaps the topic is of interest to her. Your comment and the comments of others about her feet or her nose or her other body parts seem so petty and irrelevant to me. 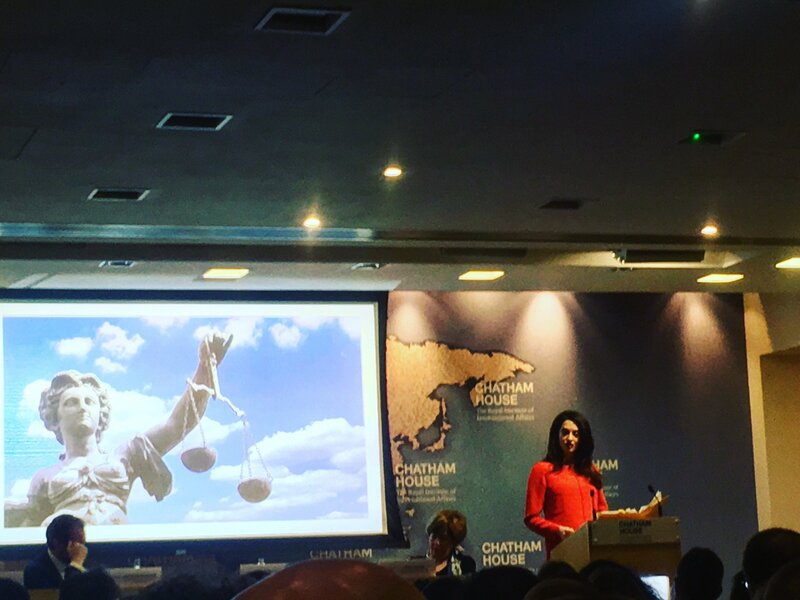 Here we have a well educated barrister engaged in important work and you care about whether her mother attended her presentation because you would not want yours to attend an important presentation you made. She wears interesting clothes. So what? Jackson, some people live between the pages of a book and are not practised in the subtleties and nuancies of real life networking and politicking. They are usually academics who have not ventured beyond the walls of an institutionalised life. If you sit back and relax a little, you might learn something about how the world works by reading the views of intelligent women that frequent this blog. Kindly show the same courtesy to others’ opinions as you ask to be shown. Please do not diminish the observations of other women on this forum because they do not conform with the rigidity of your limited experience of the world. Your statements reflect naivety. It would be endearing were it not so misplaced. Her nose looked really different too before George. Mary: Amal gives an important presentation and you are concerned with the size of her nose? Give me a break. Why on earth is this important to you? Why is a comment about her nose job diminishing her achievements? Don’t read too much into everything. Having a nose job doesn’t take away from Amal’s work. Given that Nati comments on Amal’s numerous nose jobs – it is a topic of discussion that is acceptable on this gossip and fashion blog. 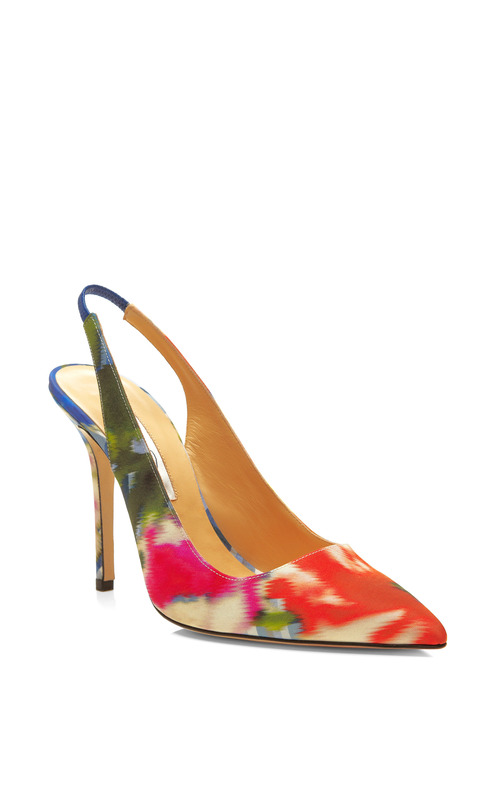 The shoes are simply wonderful, unfortunately not good for deformed feet (bunions) as the pattern is attracting much attention to the feet. 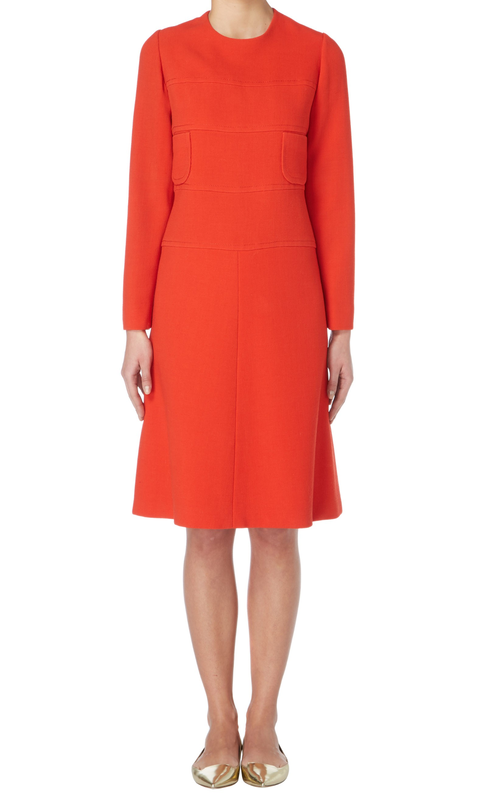 Coat and dress are elegant and classy, love the simplicity and the colors. Amal´s new lips (i.e. lip filler) are a success, although I prefer a natural look instead of fake perfection. Her heavy make up surely needs much time, did she the work herself ? There is something I don´t like: showing off her ring, hair flicking and posing like a model, all this is silly! 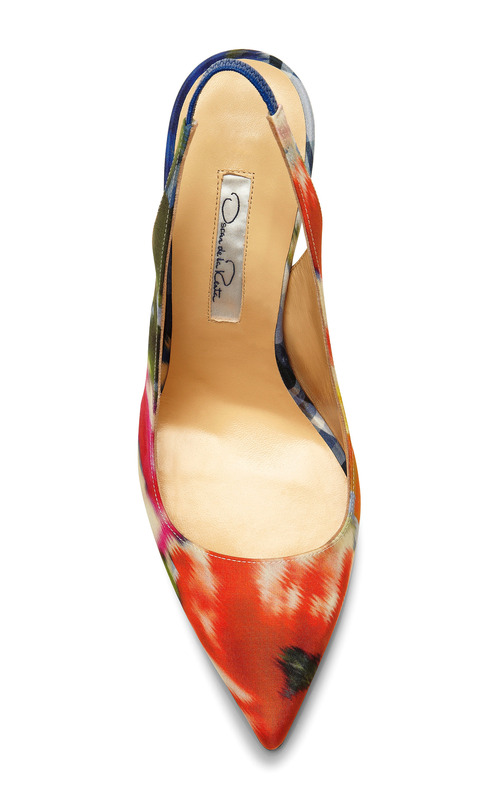 Caroline: She has worn the shoes several times. They go well with her outfit in my opinion. Her feet are her business :). 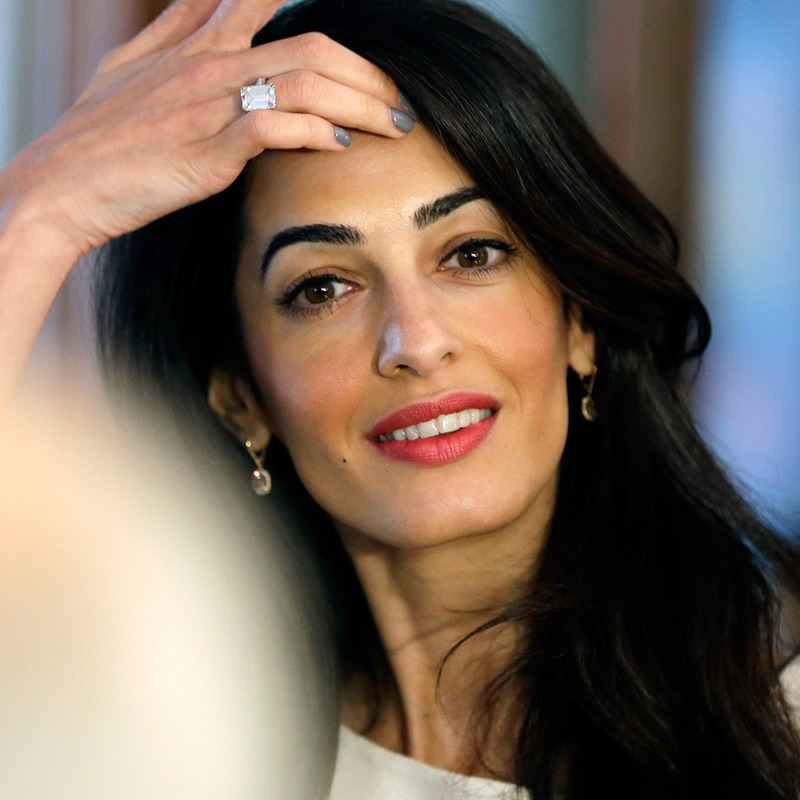 Jackson: are Amal’s feet really her business? When a person puts themselves out in the public eye, comments on their appearance are made. She puts herself out there with her fashion- even a blog was created about it- therefore accept the reality that it’s happening. It’ll make you more relaxed and happy. She has a new nose ,a new lips and a hairextensions , a false eyelashes , why ? Amal looks for a perfection bit a natural is better . Great cause. Elegant and professional outfit. 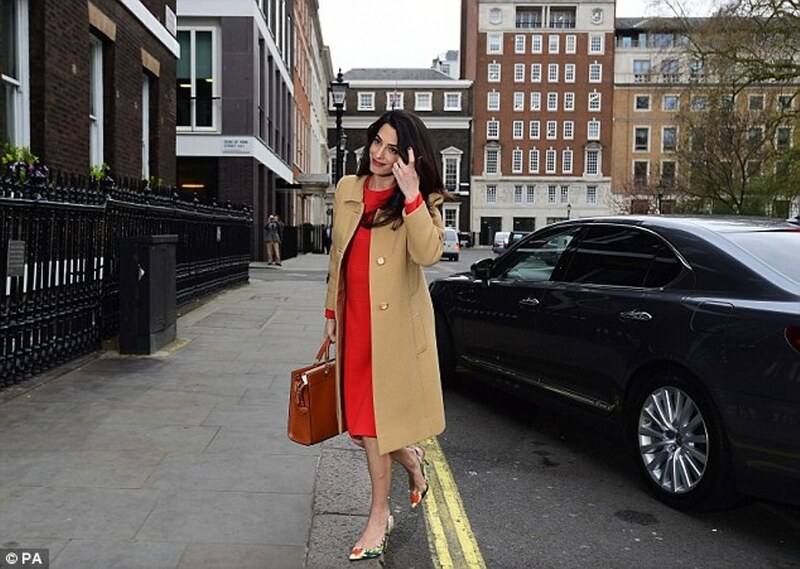 @ Maria Busck – Amal is wearing mostly fresh-off-the-runway looks, head to toe, without any personal note, using a stylist, very likely getting advice from Anna Wintour, her make up and hair done by professionals …does this make her a STYLE ICON? As TRUE style icon you have to dress in a way that reveals something original about yourself, which is where costumes fail. Fashion icons’ personal style has to have an influence on others. Those who are truly remembered for their fashion choices are long gone, but their style is ingrained in popular culture, e.g. Jackie Kennedy, Audrey Hepburn, Diana Vreeland. Amal clearly enjoys fashion, her husband is rich enough to pay for expensive clothes, additionally she is able to borrow clothes and accessories from high fashion designer (like many other celebrities) who use her as a kind of advertisement. The resulting effect: a model in a Vogue fashion advert, presenting the newest collections … not in Vogue, but in the streets, in the UN, in restaurants etc. I agree with you. I keep saying it – but this extreme conspicuous consumption and intertwining of glamour with serious work, sets women backwards. It is folly. Men do not draw attention to themselves at work in this manner with the latest runway fashions, hair stylists and make up artists. She needs to make up her mind about her vocation and stop ridiculing the inroads women have made to be taken seriously at work. She is not a style icon, but lesser than that, she is not an appropriate role model for younger intelligent women. She is a hybrid of vanity and consumerism with a law degree. She disappoints where she could have revolutionised the world. So very very sad. look in the mirror every 10 minutes. She may be a human rights attorney but I also suspect she is very insecure. caroline, your YSL quote makes my day, not only for YSL being my personal #1. i second every word of your statement. of course amal clooney is as little a true style-icon as any other celebrity is who does the paid for runway-street-walks. the amal hype in the general media has already started fading, her ‘nouveautè’ factor is gone. soon someone else will be labelled ‘hottest …. whatever’ and sartorial rolemodel for a certain period of time. they come and go. jackie kennedy remained a style-icon in her later years when for her daywear, she would pick ‘simple clothing’ instead of designer brands. look at the fabulous kate hepburn and the equally famous greta garbo and marlene dietrich, who all became true style icons defining their styles through their personalities and lifestyles, not by sporting interchangeable designers any given day. 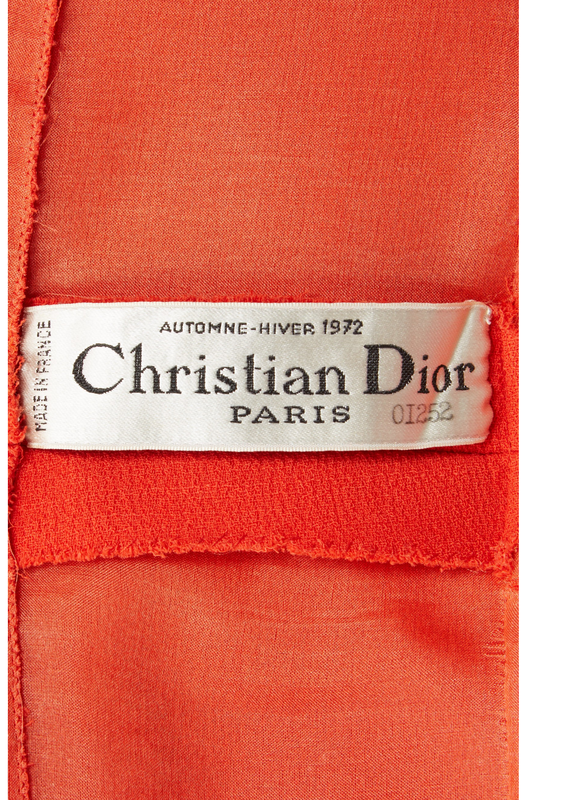 they wore ‘no name brands’ – a contradiction in itself, i admit – but they had great personal style. 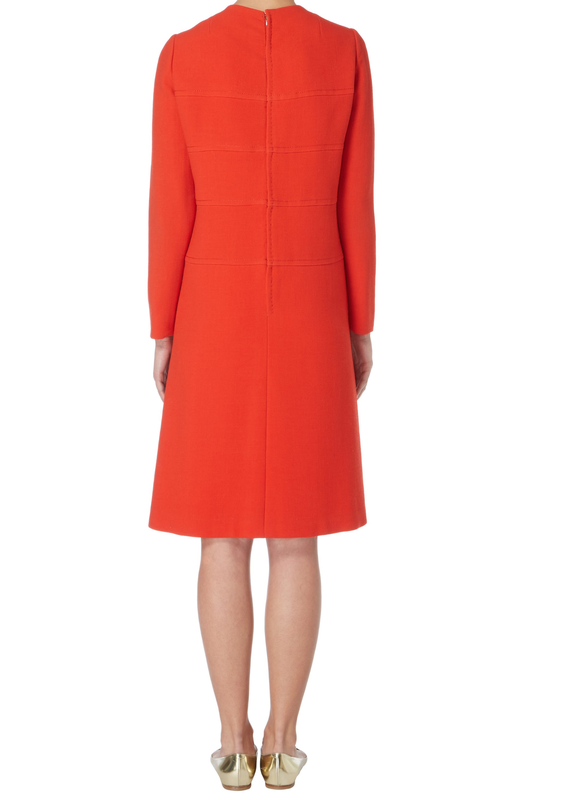 That red dress would be $8,000 CDN. 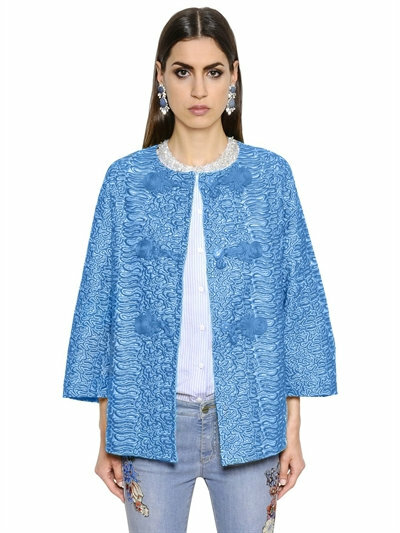 Baria’s jacket $3,500 ??!! How much we’re the pants ??!! Too expensive! I wouldn’t spend a nickel on the jacket OR the pants! I don’t care for Baria’s style at all. I don’t find any of her outfits appealing or attractive. Most of the time they are Over The Top! Soos asked me for the ID, so I posted it. 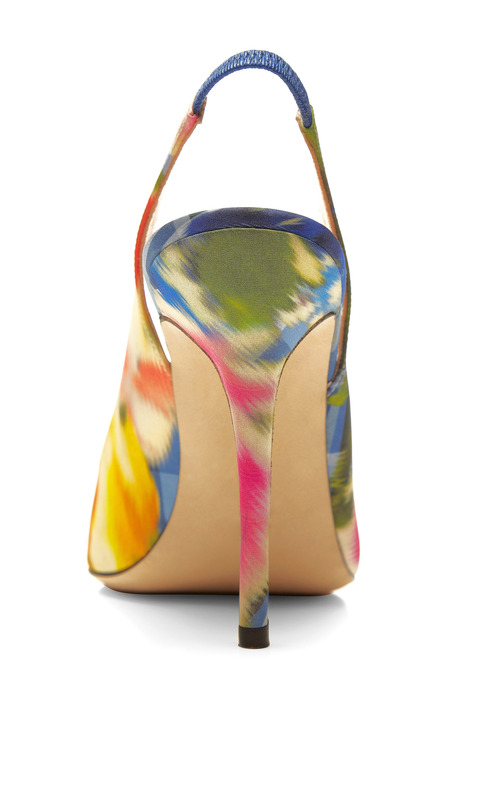 Baria loves luxus too. It is not a surprise. I hope Amal is not bankrupting George with the clothes. She could look just as good is she spent less.